Jennifer Fewell, Center for Social Dynamics and Complexity, Arizona State Univ. Tina Wey , Biology, New Mexico State Univ. Objectives. The structure and functioning of social networks is of rapidly growing interest in evolutionary biology. While modern network analysis offers many sophisticated techniques, most were developed for extremely large networks, not for the smaller networks most commonly found in non-human social systems. Furthermore, biological systems change through time, and many questions of fundamental importance involve network dynamics. Thus there is currently a need for modern network analysis techniques that are specific to these systems and issues. This workshop will explore problems and opportunities raised by small (tens to hundreds of individuals) social networks as they develop over time, with special focus on three issues: 1) how temporal dynamics affect network function and emergent properties, 2) the response of the network to perturbations such as births, deaths, immigration and emigration from the social group, 3) the tension between a focus on network structure (e.g., importance of roles and network centrality) and process (e.g., flow of information, disease transmission). 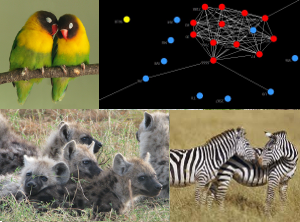 The group will bring together empiricists interested in a diversity of animal social groups (ants, fish, birds, mammals) and quantitative scientists (network scientists, mathematicians, computer scientists, physicists) interested in the special problems posed by the dynamics of small social networks. Animal Social Networks WordPress Site. Summary Report. The workshop began with plenary sessions giving broad overviews of the history and current status of this burgeoning area of research. For the first two days, the schedule included clusters of talks, interspersed with group discussions and a poster session. Talks and posters included presentations on both empirical questions and specific systems of study or more general analytical and theoretical approaches. Discussions focused on identifying issues of general concern, steps needed for bridging the gap between empirical data and theoretical work, and identifying relevant analytical techniques for major questions in ecology and evolution. Another major issue that emerged was the need for standardizing the collection and analysis of animal social network data to allow comparative analyses and move beyond system-specific analyses. The last half day consisted of large and small group discussions to identify and organize concrete products. Discussion on the last day also focused on creating specific resources to facilitate larger-scale data organization and communication among researchers. There is currently active continuing research between new collaborators on specific questions, as well as a group working on a proposal to develop a Research Coordination Network for animal social networks. Smith JE, Estrada JR, Richards HR, Dawes SE, Mitsos K, Holekamp KE. 2015. Collective movements, leadership and consensus costs at reunions in spotted hyaenas. Animal Behaviour, 105: 187-200. Acosta A. 2014. Proposal: Coral population connectivity in the eastern tropical pacific, using biophysical modeling. Colciencias & Pontificia Universidad Javeriana. $75,000. Accepted.